Kartina IP TV over the internet There are 5 products. 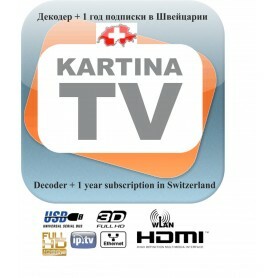 Kartiina TV IPtV IP tv in Switzerland receive the Russian channels without parable is now possible! Kartiina TV is more than 100 channels thematic Russians and 17 radio stations.. .via internet in HD quality, available in less than 5 minutes in your living room! You live in an apartment and / or you can not install satellite dish to receive your favorite channels, you have an ADSL internet (mini 2 Mbps), then Mohammed TV is the solution. This pack included the IP receiver as well as a year subscription to Kartina TV satellite channels. СМОТРИТЕ РУССКИХ ТЕЛЕКАНАЛОВ, КАК ЕСЛИ ВЫ БЫЛИ В РОССИИ БЫ! ЭТОТ ПАКЕТ ПРЕДСТАВЛЯЕТ ЦЕНТРАЛЬНЫЕ РОССИЙСКИЕ КАНАЛЫ ПОДБОРКУ ПОПУЛЯРНЫХ РАЗВЛЕКАТЕЛЬНЫХ И МУЗЫКАЛЬНЫХ, А ТАКЖЕ НЕСКОЛЬКО ДЕТСКИХ ДОКУМЕНТАЛЬНЫХ И ИНТЕРНАЦИОНАЛЬНЫХ (СНГ СТРАНЫ) ТЕЛЕКАНАЛОВ. СМОТРЕТЬ ТЕЛЕВИДЕНИЕ БЕЗ СПУТНИКОВОЙ АНТЕННЫ И КАБЕЛЯ ВОЗМОЖНОСТЬ ЭТО! ЭТО ОГРОМНОЕ КОЛИЧЕСТВО КАНАЛОВ ОТЛИЧНОГО КАЧЕСТВА! ЭТО ОТДЫХ ДЛЯ ВСЕЙ СЕМЬИ!